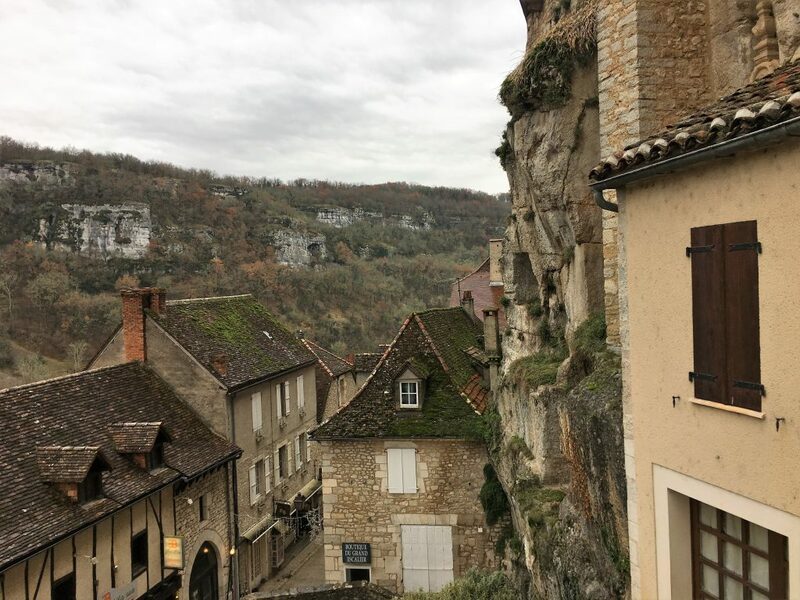 Rocamadour is one of those ‘must see’ tourist destinations in France. Most lists of ‘best places to go’, ‘most dramatic destination’ etc include this vertical town that is built on and into the side of a cliff. We decided to make it our first stop in France on the way home so that we could see it for ourselves. First though we took a final opportunity to do some shopping at Spain’s prices and fill up with Spanish fuel before leaving Les and crossing the border. Almost immediately we could see the influence of the infamous Gilets Jaunes. 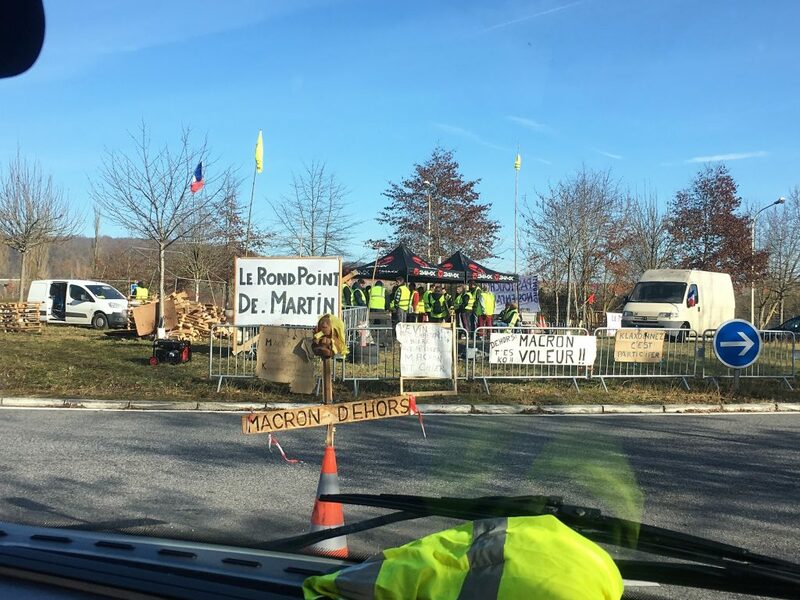 All the cars driving towards us had yellow reflective jackets folded up on their dashboards, a signal intended to indicate solidarity with the protestors against the most recent of the French government’s increases in fuel duty. This triggered an interesting debate about whether we really felt solidarity with the protestors. 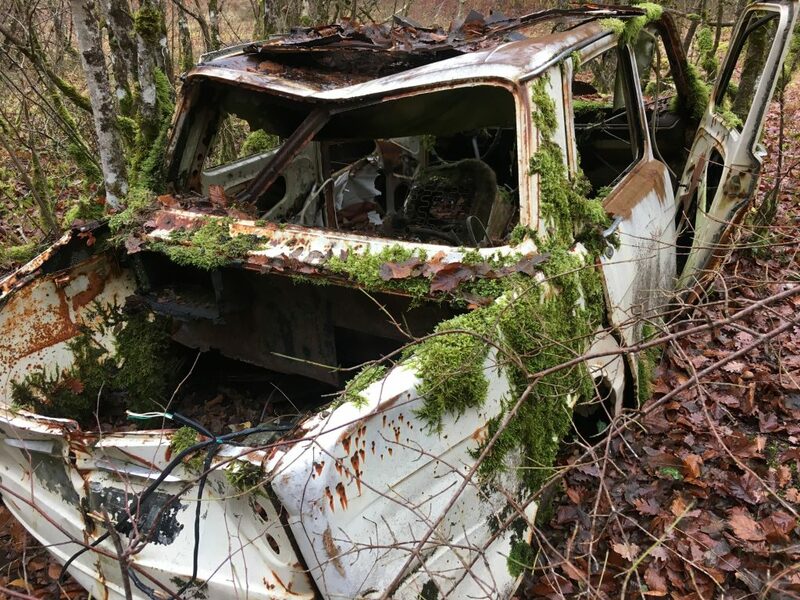 As we only have a limited understanding of French fuel taxation, and given that we both believe that something needs to be done to cut down on pollution from transport (yes – while driving a heavy gas guzzling machine – we know we are hypocrites) it was a tricky one. My concern with increasing fuel costs is that it hits everyone, rich or poor, leads to inflation and doesn’t actually do anything to reduce car use without other measures (ie better public transport) in place. Anyway in the end we agreed to put one of our reflective jackets on the dashboard for the pragmatic reason that we might find it easier to get through any blockades. We did see a few protestors, mostly on the roundabouts near exits for major roads, but we didn’t get held up for more than a few minutes. Most of them looked at our number plates and waved us through, once we were offered some sort of fudge like sweet (yum) and a few times we got a cheerful wave. It was quite cold so I was surprised how upbeat the protesters were, but then they had constructed some fabulous shelters from pallets and tarpaulin, including braziers burning brightly for warmth. We knew that Rocamadour didn’t have any services, just motorhome parking so we stopped on the way at Grisolles (somewhere we have been before) to empty our waste and fill up with water for 2 euros. As we approached Rocamadour the sun was so low in the sky that we could see very little as we drove towards the town. It made us both quite tense and tetchy as we tried to ensure that we were following the satnav directions, so when we reached the car park to find it mostly closed off for resurfacing we were not in the best of moods. We ended up tucking into a spot in the corner where we didn’t seem to be in the way of any heavy machinery that might be entering or exiting the car park. The following morning we were awakened at 8am by the reverberations of a pneumatic pile driver; a sound that would accompany us throughout the day as we walked the gorge, top and bottom. We were parked at the top of Rocamadour’s cliff, next to the Chateau and for our walk we took the track that leads south from the car park. This followed the top of the gorge for a while, with fantastic views into the gorge bottom, a wide ribbon of green where the river once ran. 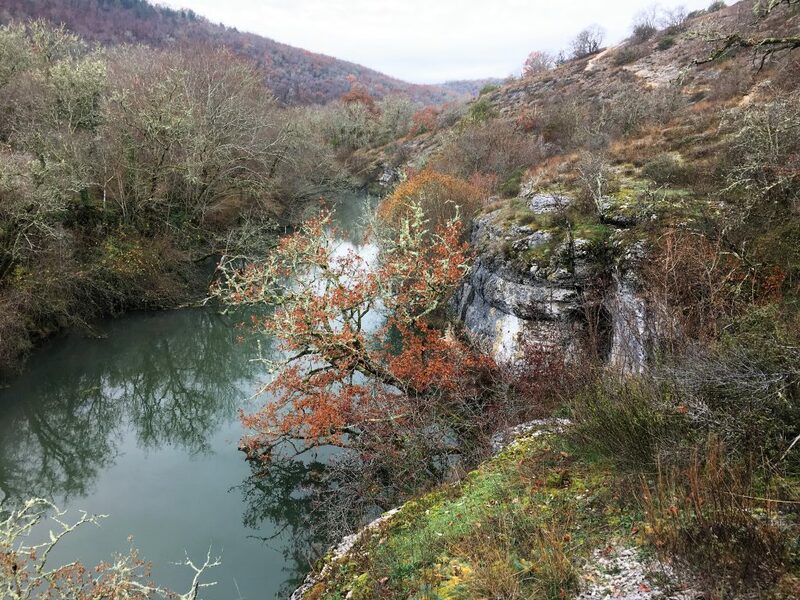 After a while the track veered away from the gorge towards the village of La Fage and once we were through the village we turned south west into a smaller subsidiary canyon which we followed to the main road, crossing the road and L’Alzou river. We passed ruined farm buildings, old farm machinery and one very poorly car. I dont think this will go??? The path continued to the Ouysse river where we stopped at the ruins of an old mill to have some lunch. 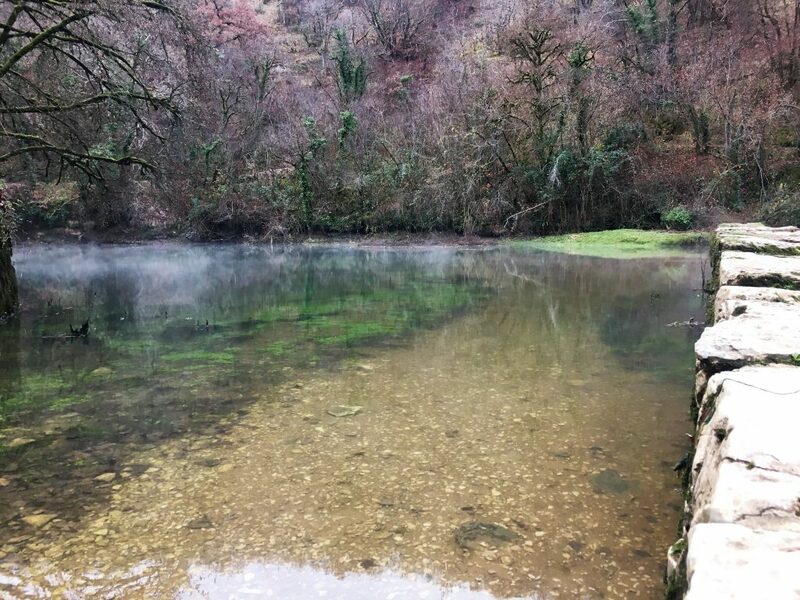 The subterranean river emerges here, and we sat on it’s edge watching the water gently steaming in the cold temperatures (we weren’t sure if it was a ‘hot spring’ but the water was very tepid). A kingfisher flitted by, the first I have seen for ages, a brief flash of blue following the course of the river. From here we followed another track through another small gorge which finally emerged on a road, we were following our noses by this point and weren’t sure how far we had to go but could still hear that pile driver in the distance. 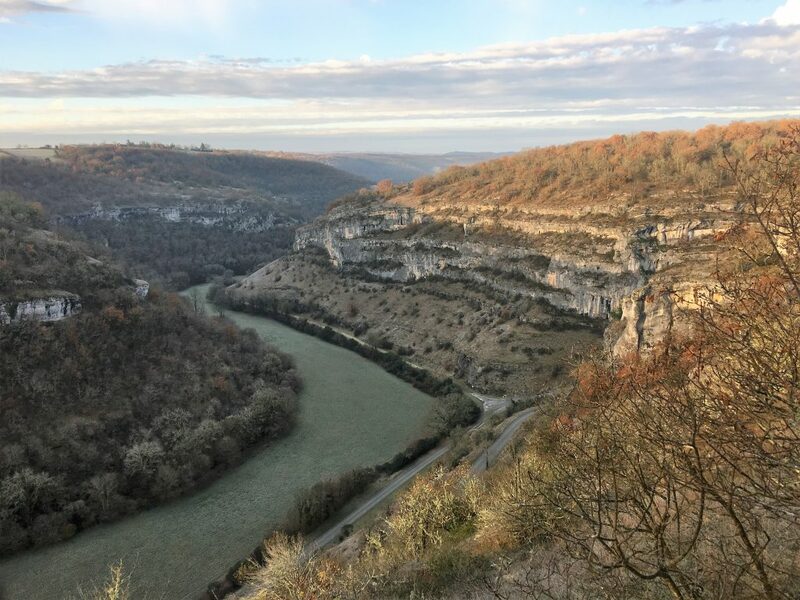 We took the road north in the hope of gaining some height and soon we gained sight of Rocamadour’s canyon. We didn’t have to stay on the road for long as a trail led away to the left and steeply down the side of the main gorge towards the town itself. 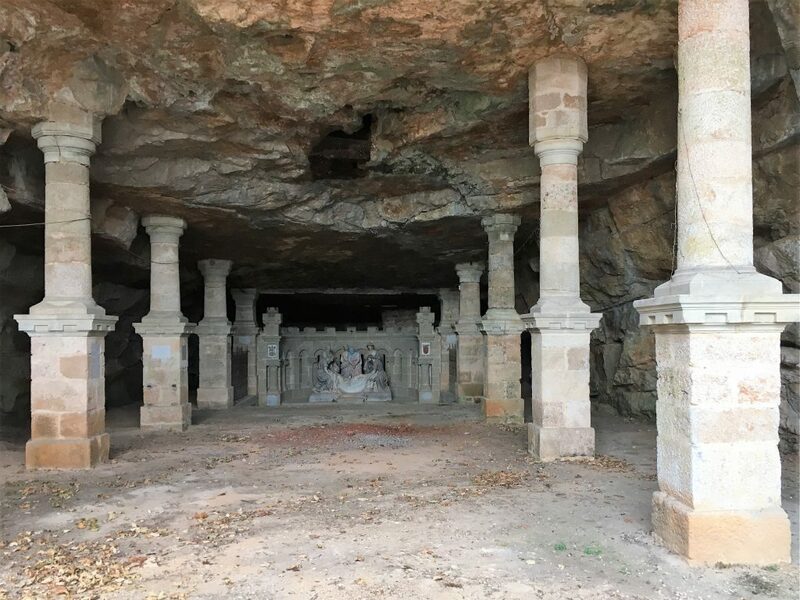 The town was very quiet as we explored the chapels and caves. The town has long been a pilgrimage destination, although history has blurred the stories associated with it’s holy significance. Paths and stairs climb up the side of the cliff weaving through the buildings and past chapels and shrines, including the all important Church of Our Lady. There were a few worshippers and we felt like interlopers intruding on their devotions. We spoke in hushed voices and felt a need to tiptoe around as we poked our head around the doors of the chapels. In summer the streets would be bustling, filled with tourists, the shops and restaurants would all be open and spilling out onto the pavements, but today the whole town felt peaceful and serene. 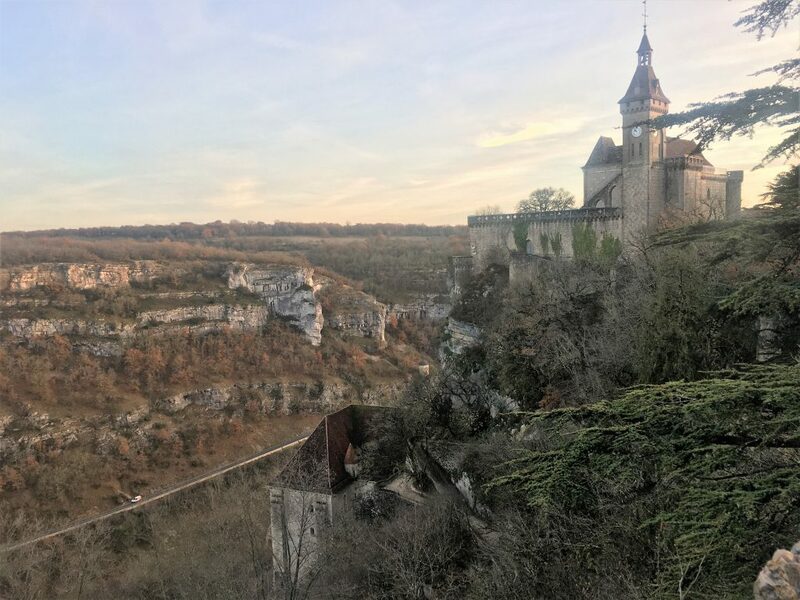 After exploring we climbed up the Chemin de Croix, a weaving zig zag path that took us past the stations of the cross and various caves and shrines, up to the Chateau where we were parked. When we finally got back to Bertie’s cliff top parking we decided to move on. We wanted to find somewhere with electricity as the forecast was pretty chilly so we found a free parking spot in the central market square of Bessines-sur-Gartempe. There were several electricity points, which looked like they were supplied for the local market, plus motorhome services. We were soon joined by a few other vans who were also making use of the very welcome electricity to power their heating. To say thank-you for the freebie we made use of the two local patisseries, holding a private competition to determine the best chocolate éclair, we couldn’t decide on a winner and afterwards felt rather icky from our overindulgence.